This course is designed for students who are interested in a career in hairdressing and beauty care. 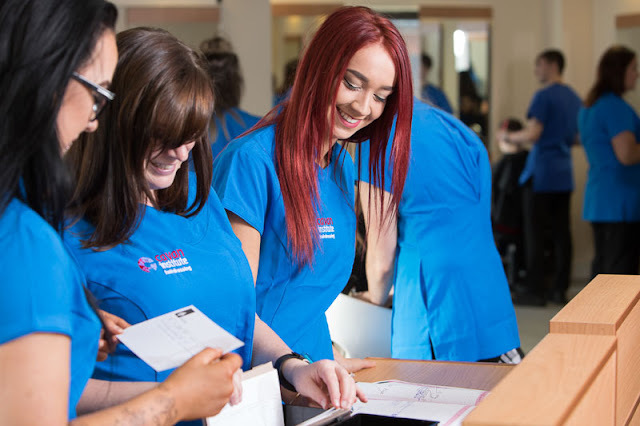 Students will study and practise all aspects of women's and men's hairdressing and beauty care to include skin care, eye treatments and make-up. Hygiene, Diseases, Health and Safety. Hair Extensions including Bonding, Clip and Weft techniques. Students who successfully complete this course will have the necessary skills to pursue a career as a hair stylist or sales representative for hairdressing products. Other opportunities for graduates include employment on cruise liners, with airlines and in the media and travel industries. Further employment opportunities may arise for qualified students offering beauty treatments in hairdressing and beauty salons. Graduates of this course may progress to the Advanced International Diploma in Hairdressing course.